I’d stay away from the Delta TS300. It’s not a full size saw (22” table length instead of 27”). The craftsman you posted is a decent little saw and the price isn’t terrible. Welcome to the forums! Others are much better for your question than I, so I’ll just say “hello”. I would venture to say you can get the Craftsman for less than the asking price. Seller will usually come down some. 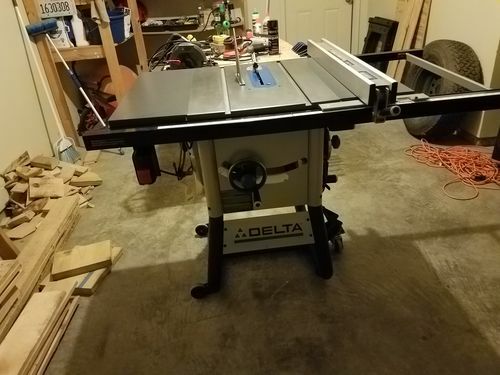 The main saws I have researched are the R4512, Delta 36-725, and the extremely tempting sawstop, but I feel that it would be better, as this is my first table saw, to find a nice used saw for now and save the money for the big boy later. If you’ve done the research and have the funds available, get the “big boy” now. Why wait? There’s a world of difference between them and the saws you’ve referenced from craigslist. Having said that, I agree that the Craftsman is probably the better deal of the two. I would skip the Delta TS300 for the reasons Gaffneylumber stated, plus it has a universal motor. The older Craftsman contractor saw you linked to looks like a solid deal on a decent saw to me…..looks to be in good shape, and has the better fence. That price is fair, but it can’t hurt to offer a bit less and go from there. Nice! So glad to hear of your good fortune. You will indeed enjoy all that saw can offer for years to come. And thank you for your dedication and service to our great nation! Good deal. That should serve you well. We live south of stl, but my wife is from O Fallon IL. We were on the base recently for the air show. Wow. Good for you. That’s a lot better looking saw than the one I started out on. I’m thinking your not going find a need to upgrade for quite some time. I grew up in the USAF. Dad retired as an MSGT in 68. In fact I was born on a base in France. Lots of fond memories about base living. My appreciation and respect. Congrats! Nice deal. Double check the alignment, and put a decent blade on it. It should serve you well. I am very thankful for the support. Everything is dead on as far as being square. The only thing I believe could be a potential problem is the fence. When moving across the rails it can slightly scrape the wings and table, but when locked down it is DEAD ON ACCURATE, which is the only reason I am hesitant to start messing with it. Its just not as free-floating as I have seen before with this saw. Has anyone else experienced this or am I just being picky?